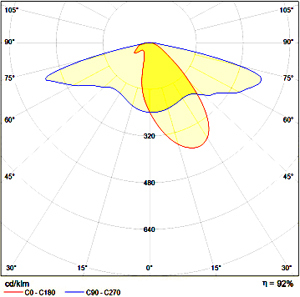 By a downward illumination - pointed to the road along with the sidewalk - a ULOR = 0% (Upwards Light Output Ratio) is achieved. 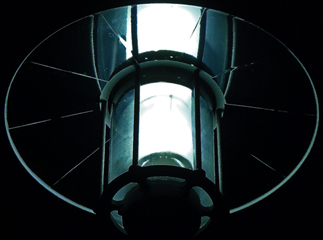 Therefore - apart from the reflected radiation on the ground - no brightening of the night sky is caused by direct lighting of the luminaire. Power consumption: 10-20 watts, adaptable to mounting height. Dimmable from 10 to 100%. 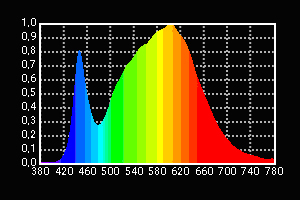 A maximum of 10 watts are required in most lighting situations. 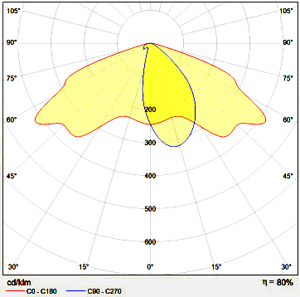 In addition to the beam distributions depicted below, many other arrangements of lens systems are possible. 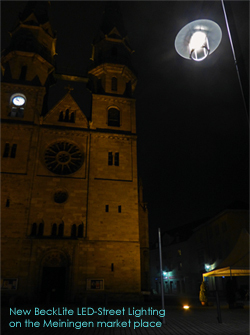 Thus the illumination can be adapted to different installing situations. 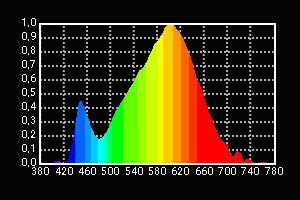 Below the spectral curves of light colors warm white (3000K) and neutral white (4000 K) are shown.